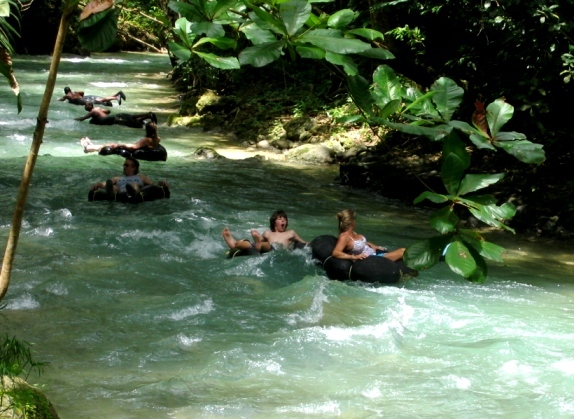 Your Ocho Rios Zip line & White River Tubing adventure begins directly from the Ocho Rios cruise ship pier or Ocho Rios/Runaway Bay resort. Journey into the hills passing through villages, lush vegetation, and locals doing there normal chores. We now arrive at H’Evans Scent, located over 2000 ft. above sea level with incredible coastline views. H’Evans Scent Jamaica was the first to introduce Zip Lines to the Island and they have stayed ahead of the competition due to there unique offerings. Upon arrival, you will be met by the friendly staff who will give you your first real taste of Jamaica, a natural fruit drink made from seasonal fruits, served in a calabash cup. Each ride is a different experience, and once you have been harnessed you will receive safety instructions before moving on. Persons are required to climb a staircase. Once on the launch platform, the instructor will give you your final briefing and then you are ready to zip 500 ft, across the valley. You are met on the other side by two members of staff, who will take you off the line and then it is a short walk up hill to the second Zip line. Once clipped to the zip line at ground level, you are required to make a short run to the edge of the platform and jump off, this gives you the momentum to traverse across the valley back to where it all began. The garden swing ride will definitely leave you screaming uncontrollably. The seat accommodate up to 3 average sized people. Once you are connected safely to the bar, a cable will automatically pull you back until you are 60ft in the air. When the motor stops, one person must pull a ripcord that releases the seat holding all the riders, they then swing 180 degrees through the air until the swing comes to a stop. The “Awesome Zip line” runs 1200ft across a scenic valley. To reach the launch platform, after you are attached to the safety line, each guest must climb up the staples (metal steps on either side of the pole) to the platform 50ft in the air. (For this zip you must weigh more than 110lbs and no more than 250lbs). It is a great ride and it gives you the thrill of a lifetime. Once you get to the other side of the valley, two members of staff then take you off the line. A walk up the hillside passing goats and cows leads you to the last and fastest zip. Climb a staircase to about 10ft off the ground. After a safety check, push off holding your legs up as you skim close to the ground, picking up speed as you zip across the scenic valley back to where you left a few moments ago. From here, it’s a short walk through the fields past local produce being grown and folks doing their daily washing and cooking outdoors. 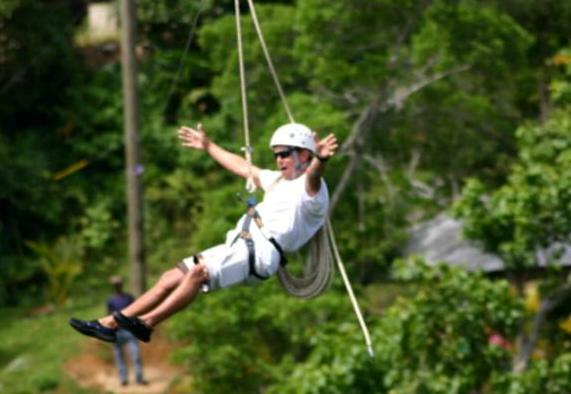 Your Ocho Rios Zip Line excursion now comes to an end. We now continue on to famous White River. 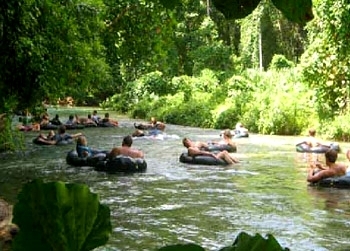 On your journey to this inviting river you will have the opportunity to view "behind the scenes" Jamaica, while driving through the local neighborhoods of Ocho Rios. Upon arrival at White River, you will find a changing area, life jackets, and a shop. If this is too much adventure for one day, there is a bar nearby where one can enjoy a frosty Red Stripe and relax beside the water. The entire White River adventure lasts approximately 1 hour and 10 minutes, depending on how much time is spent at the midway stop. Your guide will pick you up at the conclusion of the tubing and take you to a duty free shopping center before returning to your ship or resort. There is also an optional stop at the renowned "Margaritaville" where Jimmy Buffett's "Parrothead" fans love to relax, listening to his beloved songs, while enjoying a water slide, rooftop whirlpool, regular pool, and of course, a swim-up bar for a variety of beverages. Wear sneakers and knee-length shorts or pants with full t-shirt to prevent rope burn and abrasions. Our tour was extremely fun! We love the zip line and every second of tubing down the beautiful river. It was so relaxing and soothing. Our driver mad our experience even better. He was very friendly and patient. We will definitely use your service again! We enjoyed the tour and the driver was nice. We had lots of fun at the zip line place. We felt the staff was knowledgeable and friendly. The tubing was also fun. We would highly reccommend the place, and will do it again, the next time we come to Jamaica. The experience me and my whole family had there was absolutely AMAZING, we are already talking about coming again. The experience was made so wonderful by the really awesome people that caitered to us and we hope to see all of them there next time we venture there. Thank you so much for the wonderful experience and we can\'t wait to see all of you again. Incredible journey in the hills! 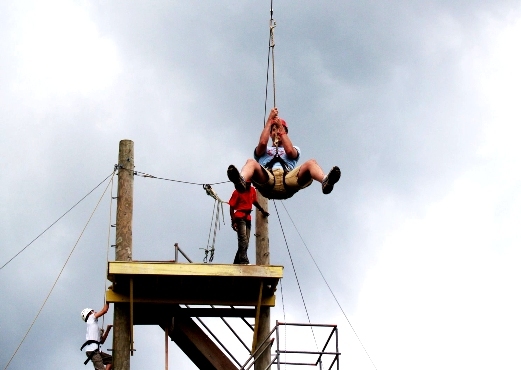 The ziplines were really exciting. We had a blast. Then we cooled down in the nice clean water at tubing. Thank you for a wonderful day! It was fantastic and I would recommend you to my friends in the future! THis adventure was unbelievable and the best. The people the driver and the price was worth the trip. The weather did not prevent and delay us in enjoying the day. WE had a fantastic time. The driver went out of his way to make this a very enjoyable day. We had the BEST time and Silvan could not have been a better guide. Our boys said it was the best day of their lives and your team was a big part of that.. We can\'t wait to do it again. The best activity for the best price without a doubt! We have already been recommending Jaital to everyone we\'ve told about our trip. m replying on the two tours that my wife ( and myself (booked with Jaital. For our first honeymoon in thirty years, cause we had kids so we couldn\'t go anywhere. For myself and my wife, we had the best time of our life. We would use your services again. The other five people that came with us were also very pleased. I\'d like to say THANKS and diffidently use the services again. The driver was funny and nice to talk too. The guides were also very good. Over all GOOD. We really enjoyed our excursions with you. Our driver Silvan was awesome! He was very knowledgeable about his history of Jamaica. He was very patient as we were late meeting him at our lobby. It was nice having our own driver doing the trips in a minivan rather that a big bus with lots of other people. The tubing was incredible. It was relaxing and breathtaking with a bit of rapids here and there enough to get you wet. We really enjoyed the Dunns River Falls. What an experience! I highly recommend it. Your website was very informative and offered the best multiple excursions for a good price. Thank you to the Jaital staff and to Silvan who made our experience in Jamaica an amazing and memorable one! We would recommend you for sure.